I’m back with more nail art ideas. 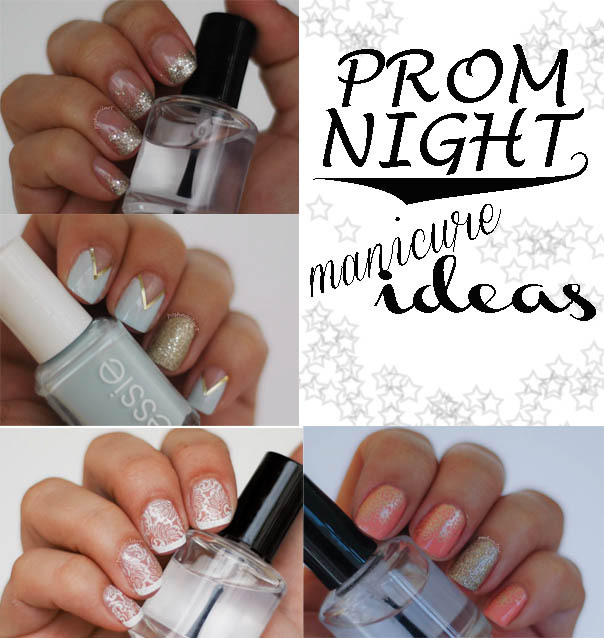 It is prom season, so this month, we will be covering easy and elegant prom manicures. I have been to 3 proms in my life, one for middle school, one for high school and one for university. I wish we had internet back then with blogs and pinterest so I could decide easily what to wear, or how to style my hair. 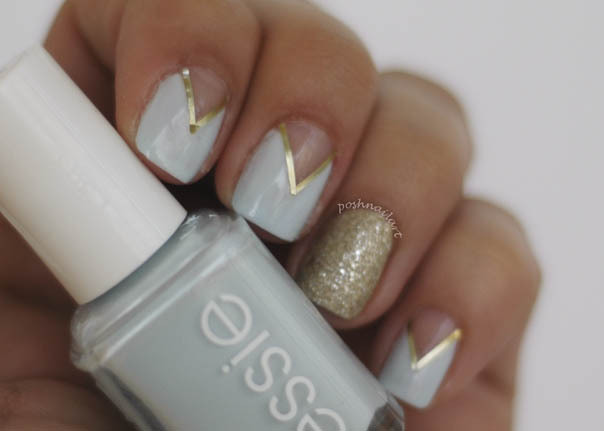 Anyway, my first mani is a geometric negative space baby blue mani with a gold accent. Let me explain how I achieved this look. I cut triangles from scotch tape and placed them on my naked nails (well, not naked exactly, I used a basecoat. ALWAYS use a basecoat). I painted two coats of baby blue on my nails and while the paint was wet, I removed the tape using tweezers. When the polish was dry, I cut tiny pieces of gold colored nail art tape and stick them on my nails. Then applied a coat of clear top coat. For the accent nail, I used a gold textured polish. You may change the polish color to match your dress, but the process is the same. 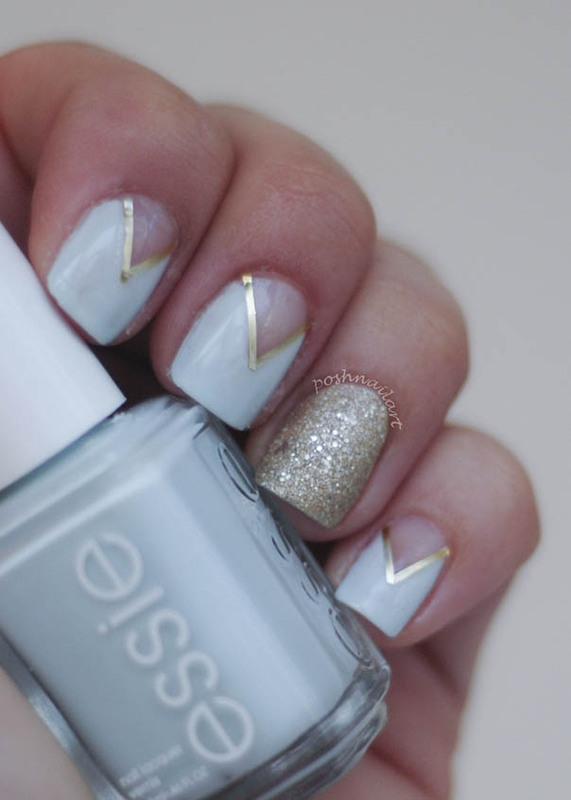 Or you may use a bold colored nail art tape to give it a funky look. 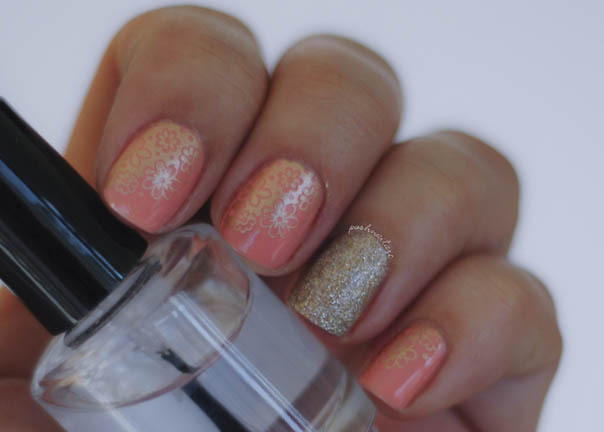 Second mani is a peach colored mani with gold glitter and flower stamping. I started with two coats of peach nail polish and then I stamped the flowers with a gold stamping polish. The accent nail is gold glitter this time. I top coated them all for a shiny finish. Third mani I did is a classic french with a twist. Pretty simple, yet elegant and suits every occasion. Again, I started with base coated naked nails. I stamped the flower images using white stamping polish and added the french tips. Finished with a shiny topcoat, but this might look lovely with a matte topcoat as well. The last mani is a really simple option. You may do it a few minutes before walking out the door, if you have a fast drying topcoat… 🙂 The technique is simple, yet elegant and again it suits almost every dress. Start with naked nails (you know what I mean). Take a make up sponge and you glitter polish. Paint the tip of the sponge with glitter and dab on the tip of your nails lightly. This way, you will only have glitter on the tips without the clear base of the glitter polish. Repeat the dabbing, until you reach the desired coverage. Finish with a shiny top coat.